The official end of summer is around the corner, Labor Day. When I was a kid growing up on a military base practically every day of summer was spent at the pool. My friends and I would meet there shortly after it opened and spent the entire day swimming and stuffing our faces with hot dogs. Labor Day at the pool was always a big event. It was the last day of summer and the last day the pool was open. The pool would be packed with families basking in the last taste of summer. Nowadays this fair skinned thirty-something-year-old avoids the sun like the plague. I’m determined to keep the wrinkles at bay for as long as possible. Labor Day has become one of my favorite days because it means the beginning of fall. Soon enough the temperatures will lower, the leaves with change and evenings will be spent in sweaters gathered around a fire. Labor Day is when we say goodbye to summer and hello to fall, and both of these events merit a celebration. Of course as a lover of food all celebrations should feature good food. So, grab a plate and get your bellies ready because I got a winner for you. I love a little heat in my food, and I love a bit of sweet with heat. 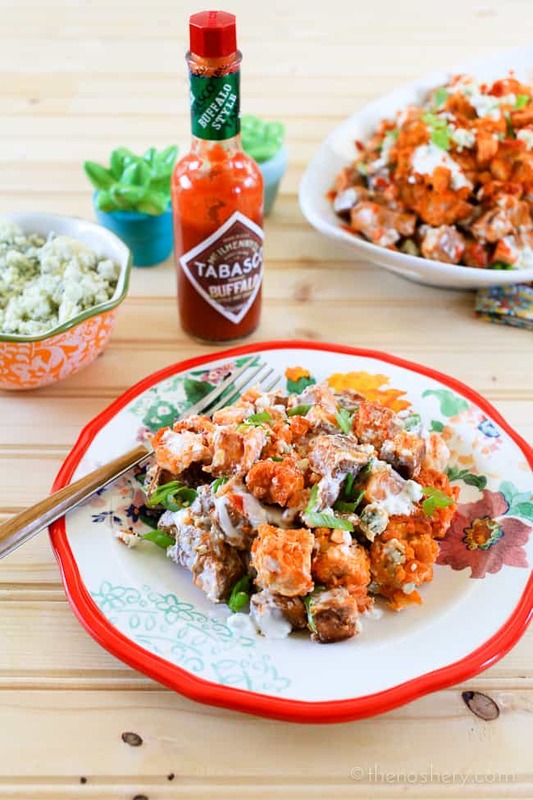 This gave me an idea to do a little twist on a potato salad by combining sweet potatoes with Tabasco Buffalo Style Hot Sauce. This potato salad is different in many ways. 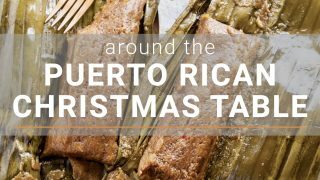 First it’s made with sweet potatoes that are roasted in the oven. I decided to roast the potatoes instead of boiling them because they stand up better in the salad and add a charred smokey flavor. 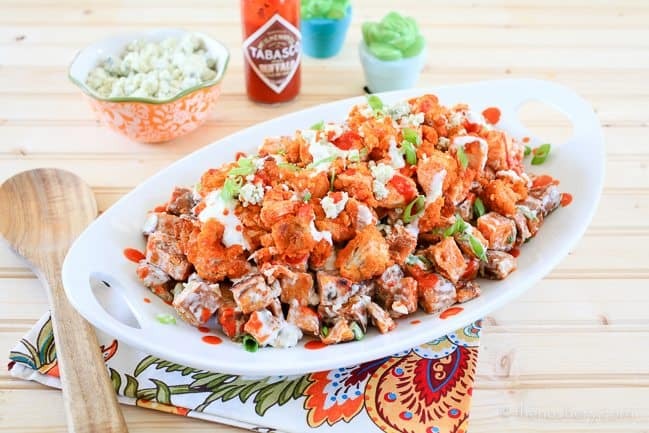 The potatoes are then tossed in a simple blue cheese dressing and topped with chicken tossed in Tabasco Buffalo Style Hot Sauce. This salad is great if you like heat or don’t. 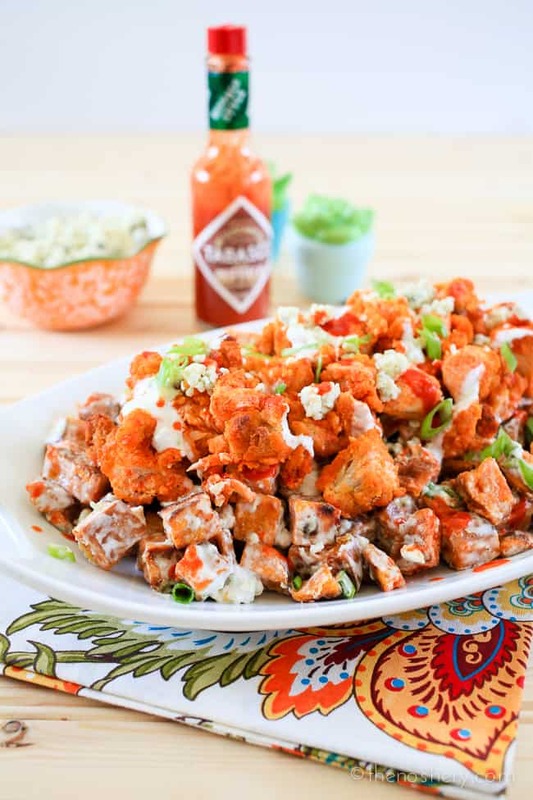 The sweet potato and creamy dressing allow you to enjoy the great flavor of Tabasco Buffalo Style Hot Sauce without getting overheated. It tasted like Buffalo chicken wings with blue cheese dressing and a side of sweet potato fries. How can you not want to eat that!? How was your summer and what are you looking forward to this fall? 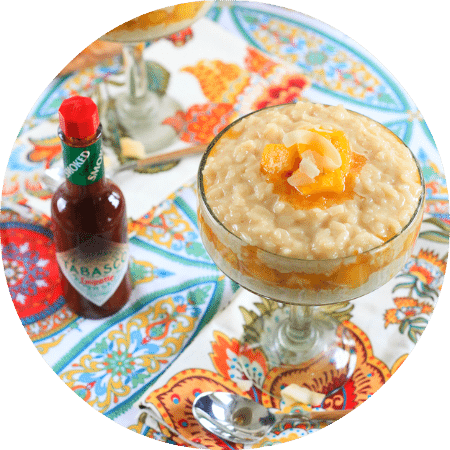 If you’re a hot sauce lover makes sure to check out my other Tabasco Sauce recipes! 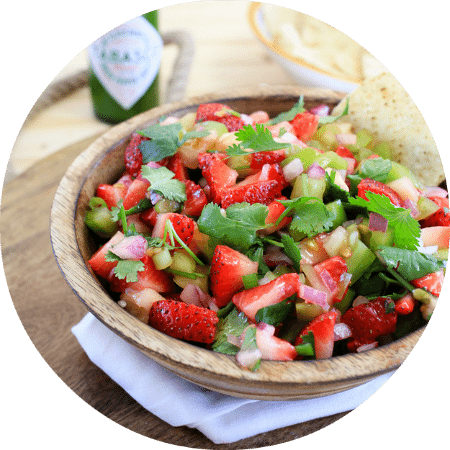 This post is part of a partnered series with Tabasco. Thank you for reading and for supporting companies I partner with, which allows me to create unique content and recipes for you. All opinions expressed are always my own. Soak sweet potatoes in cold water for 1 hour. Heat oven to 425 degrees. Line two large sheet pan with foil, dull side up. Spray foil with non-stick spray. Drain sweet potatoes and pat dry with a kitchen towel. Add half of the sweet potatoes to a resealable plastic bag with 1 tablespoon of cornstarch, shake until evenly coated. Repeat with remaining sweet potatoes. Toss potatoes with vegetable oil until evenly coated. Divide evenly on sheet pans, making sure not to crowd the pans. Roast in the oven for 15 minutes, toss and flip potatoes. Switch sheet pans from top to bottom and roast another 15 minutes. Turn the oven off, open oven door and let rest in the oven for 10 minutes. Set potatoes aside to cool. Prepare chicken tenders according to package directions. Set aside to cool. Mince the whites of the green onions, combine with crema, mayonnaise, cheese, garlic, and salt. Toss sweet potatoes and greens of the green onions with half of the dressing until evenly coated. Spoon potatoes on a platter. Dice chicken tenders into 1/2-inch cubes. Toss with Tabasco Buffalo Sauce. 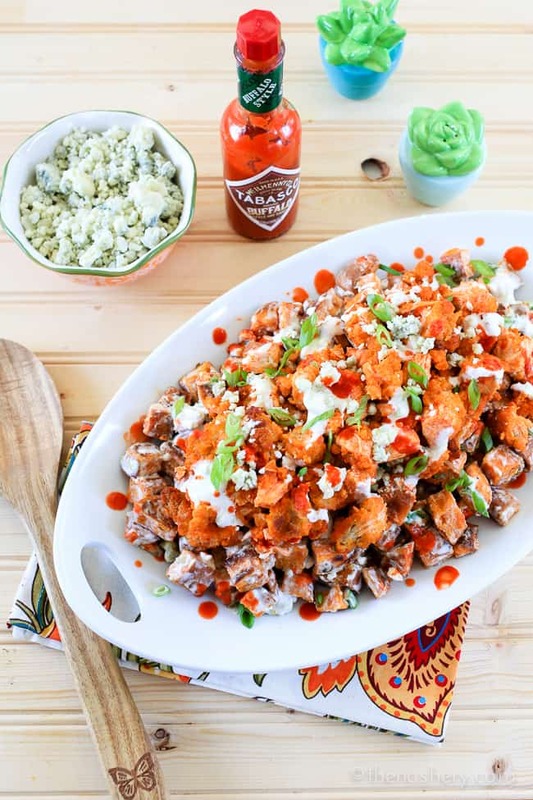 Spoon chicken over potatoes, drizzle with remaining dressing and garnish with blue cheese crumbles, green onion and dashes of Tabasco Buffalo Sauce. Serve. I have made this twice already. Perfect amount of heat for us. It is inexpensive to made and SO EASY! I am adding this to our monthly rotation! I’m looking forward to the fall flavors, crisper weather, and sweaters! This looks SO AWESOME GOOD. !!!! 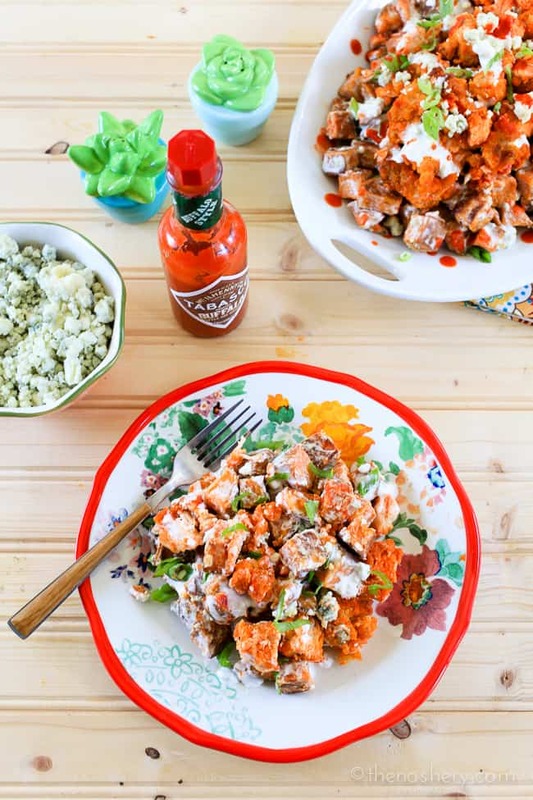 lately, i have been eating tabasco with my eggs in the morning, so delicious..and this potato salad with chicken sounds wonderful!! !